Apply three mountain-folds and one flat-fold of the step #8 only on the fornt-most layer. 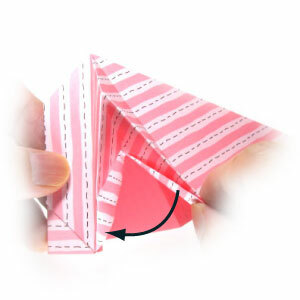 Prepare to apply a mountain-fold (1), an "outside reverse-fold" (2, 3, 4), mountain-fold (5), and valley-fold (6). 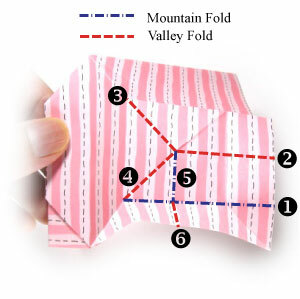 Apply the mountain-fold (1), the "outside reverse-fold" (2, 3, 4), and mountain-fold (5) of the step 9. Prepare to apply the last valley-fold (6) of the step #9).